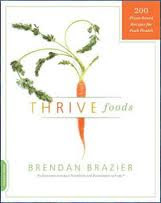 Fans of ironman triathlete and celebrity vegetarian Brendan Brazier have been looking forward to his book. With “200 Plant-Based Recipes for Peak Health” they’re bound to be pleased by Thrive Foods (Da Capo Lifelong). Coming from an athletic background, I developed my interest in food simply as a means for enhancing performance. I wanted the best fuel and biological building blocks available. As a result, Thrive Foods is rather soulless, though maybe that’s okay. The market for this book is probably more interested in reaching “peak health” and keeping fueled in a way that is both biologically and ecologically friendly than it is in a sublime eating experience. And, as I said, that’s all right: there are plenty of books that talk about passion. But how many of them indicate which recipes are raw? Linda L. Richards is the editor of January Magazine and the author of several books.